At TAO, adult film star Tera Patrick celebrated turning 33 with dinner at the Asian bistro followed by a night in the club. Joined by husband, Spyderz rocker Evan Seinfeld, her mom and friends including chef Kerry Simon and tattoo artist Mario Barth, the group of twelve toasted with Moet Rose and enjoyed Sea Bass, Sushi and Sashimi before heading up to a VIP table in the club. Once in the club, the crowd clamored to get photos of the vixen as she was presented with a birthday cake and sparklers. Producer Jerry Bruckheimer, in town for his annual Bad Boys Hockey Tournament, returned to TAO for the third year in a row. 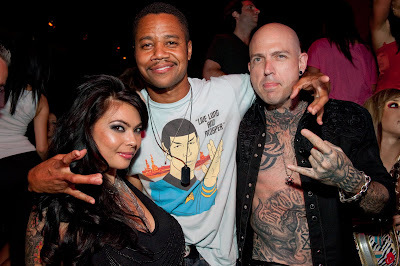 Bruckheimer was joined by actor Cuba Gooding Jr. and a large group of sports and entertainment figures spanning six tables in the VIP moat area of the club. Chart topper Ray J arrived at TAO around 1:30 am surrounded by a bevy of beautiful women. He charmed the staff and was exceptionally polite to all around him. Also arriving later in the evening were Kevin Federline and girlfriend Victoria Prince. The duo drank Jack and Coke at a table on the dance floor.